All over India there are brightly colored and decorated trucks called Goods Carriers. And all over India there are women with various provisions balanced atop their heads. 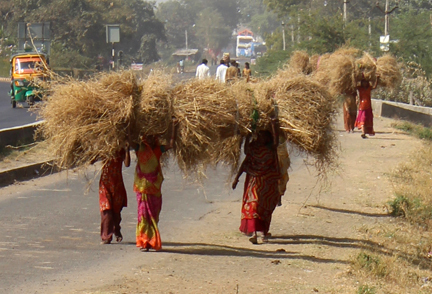 It’s amazing, really, if you look at the picture, there is no other way these women could have carried this amount of straw without some sort of cart. And the water they carry on their heads would be too heavy to haul in their arms, but the human body and spine is so strong it can almost easily accommodate the weight. Strong women. In many respects.